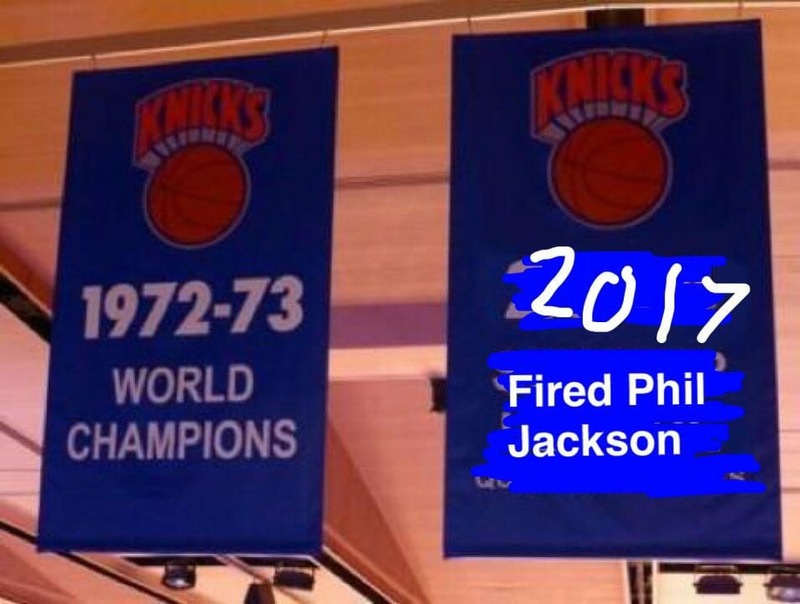 Home › NBA › Good Riddance Phil Jackson! You ever get that feeling of heightened elation that you don’t know what to do with yourself? That’s how I feel upon hearing the news that Phil Jackson had been fired by my beloved New York Knicks (and no, I’m not buying that “mutual” parting of ways BS). It’s the kind of elation that is a combination of watching your team win a championship, getting married and watching your child being born. Either way, I’m happy as a mo-fo and want to parlay that happiness into running around in my office and/or downing come cold ones during my lunch hour. You really want to know how badly Jackson screwed up? Incompetent owner James Dolan was actually the voice of reason and came to the rescue! Dolan knew he could keep a team president around who devalued the trade value of a star in Carmelo Anthony. He also knew he couldn’t keep a team president who wanted to trade a future superstar in Kristaps Porzingis because of a skipped exit meeting. And perhaps more importantly, he knew he couldn’t keep a team president who would prevent future free agent stars from signing with the Knicks. I don’t know about y’all, but this Knicks fan forgives Dolan for skipping the NBA Draft — though I will have a hard time forgiving him for what he did to Charles Oakley, but I won’t spoil the good vibes here. At this point, I don’t care if we hire a damn monkey as team president. He/she/it would do a better job than Jackson.